During the second Revolution in Egypt, on June 30, I was attending a conference in Turkey where participants from across the globe stopped me everywhere I walked to ask me why Egyptians revolted against the first elected President Morsi. It came as a shock for many people to learn that there is a second revolution against a President who has been in power for one year only to step down. Everyone was particularly concerned when they heard on the news it was a military coup. However, anyone who lived in Egypt for the last year would understand that most people, including many of those who voted for Morsi, turned against him. The reasons are endless, but the most significant in my opinion, was the hatred speech and the use of ‘us’ and ‘them’ that the Muslim Brotherhood became masters at. I am one of those who gave Morsi my vote and I supported him. I even celebrated for him in the streets of Alexandria upon the announcement of his appointment as the President. Indeed, it was a historic moment to witness the first elected President in the history of modern Egypt. The Muslim Brotherhood battled for 80 years to get to this place. They struggled to win the elections, which gave the impression that they were the most organized political party. Many people voted for them because they had a vision for Egypt and they had connections and projects that people expected would soon be implemented as soon as they came to power. No one expected their failure. We never thought that they would bring the country to its knees. 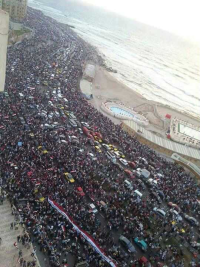 Morsi’s supporters accuse the protestors of being brainwashed by the media and the opposition. It might be true that many protestors were fueled by the media, but I have been a supporter of the Muslim Brotherhood myself and I never liked the opposition. I only turned against Morsi when I found out that he was not qualified enough to become a President. I have never spread any hatred comments or shared any rumors about Moris or the Muslim Brotherhood. In fact, I always defended the right of the Muslim Brotherhood to self expression and freedom of conscience. I put myself in many situations where I was harshly scorned and ridiculed for defending them position and for justifying their mistakes. However, millions of Egyptians like me have become fed up with the deteriorating conditions with no hope of any better future. Our life has become so difficult in the last few months to the extent that depression became a disease in our society. Morsi just failed everyone. He vowed to bring back stability and security but instead crime has increased and prices skyrocketed. Every day more news of children and women kidnapped were heard. Most of my friends’ cars were stolen and I became sure that my car was on its way to be stolen too. For one year, the government hasn’t been able to come up with any ideas or plans to collect garbage and the garbage piled on the roads spreading disease and leaving no space for walking. Tragic road and rail accidents that were caused by negligence, corruption and poor management repeatedly took place under Morsi’s regime. Traffic jam became a terrifying nightmare, and while being stuck in the traffic, dozens of beggars keep knocking on my car’s side window. About nearly half of the population being in a state of poverty and their suffering has intensified in the past two years and they have lost every hope in any improvement because of the catastrophic constant rise in food prices. Fuel shortages at pumps became frequent and drivers would queue outside Petrol station for days causing more traffic jam and disorder. Every day challenges multiplied and economic and social frustrations mounted. Life became even worse than the autocratic era of Hosni Mubarak. Daily electricity cuts made our life unbelievably harsh. Many jobs became unsecure. I personally would spend months without pay. The worst of all is the division of people into political identities and the hostility that grew between people and extended to break the unity of families. Morsi’s supporters have terrorized and discriminated Christians and looked down upon them as intruders. They have even gone beyond that by calling Muslims who stand against you as ‘apostates’. They said ‘you are either with us or against us’. Morsi failed to settle his disputes with his opposition and build bridges of dialogue with the other political parties, and we paid the price. He could not win the military on his side or resolve the crisis of the police. His unprofessional attempts to restore harmony among all state institutions fell flat. He played a passive role in stopping the media channels that fuel the conflict from spreading rumors and hatred speech on both sides. He thought making television statements was enough to bring back trust and settle the differences. It is true that he is not responsible for the tension and congestion that already existed but he didn’t have the wisdom to deal with his enemies or reconcile with his opponents. It has become apparent that he lacks a vision and strategic planning. He missed every opportunity to unite people and move forward with steady steps. His foreign policy especially towards the Syrian conflict and Ethiopia proved his failure and provoked people even more. My family has been intimidating me lately because I have been criticizing the Muslim Brotherhood. They have threatened to break all ties with me if I join any protests against Morsi. Even though Islam doesn’t allow ending relations with relatives or friends over religious differences, they are willing to do that for Morsi. While the protestors have their own reasons to turn their back on Morsi, the question is ‘why the Muslim Brotherhood turned their backs on the rest of the Egyptian people?, and why does the United States support terrorism and ignore the rights of the Christian minorities?’ While the international community can speak about Morsi’s legitimacy, the domestic pro-Morsi media channels are calling for jihad to save Islam represented by Morsi. To many Islamic countries, Morsi represents Islam and anyone standing against him is identified as ‘unbeliever’, ‘secular’ or ‘Christian’. It is irrational that our piety is now being questioned because of Morsi, who stands now as the measure of religious devotedness. There is no need even for me to prove that the second revolution is not a military coup; the streets witness the call of the people on June 30.